Measure from the top of the transom down to the bottom of the hull or keel (lowest point). Measure the area of the transom directly where the engine will be mounted. With the bracket in the down position, measure from the top of the bracket’s mounting surface down to the bottom of the hull or keel (lowest point where engine will be mounted). Tip: For most auxiliary applications, it is possible to use a longer shaft length than what is called for, provided there is sufficient clearance when the engine is in the up position. This can be especially useful in heavy seas. Measure from the inside top of mounting bracket down to anti-cavitation plate above propeller (this is the largest plate/fin directly above the propeller). The 12V charging system allows the user to charge a 12V battery. With this option installed, the outboard engine will send charging current to the battery when the outboard engine is running. The output is variable based on engine RPM. Anyone who has a 12V battery in their boat (for lighting or other accessories) and would like an alternative or supplemental charging method. Please note that the 12V Alternator/Charging System is NOT required to operate the outboard. This feature can be added to manual start models from 4hp - 20hp. How much is a 12V Alternator/Charging kit for my outboard? We offer genuine Tohatsu 12V charging systems that include a rectifier which provide your outboard with the ability to charge a 12V battery should you have the need or desire to do so. For manual start models, the add-on 12V charging system requires installation (electric start models include the system pre-installed from the factory). We recommend professional installation as the flywheel must be removed to install the charging coils. If you can not or do not wish to complete the installation yourself, any marine tech should be able to complete this service for 1 hour of labor. 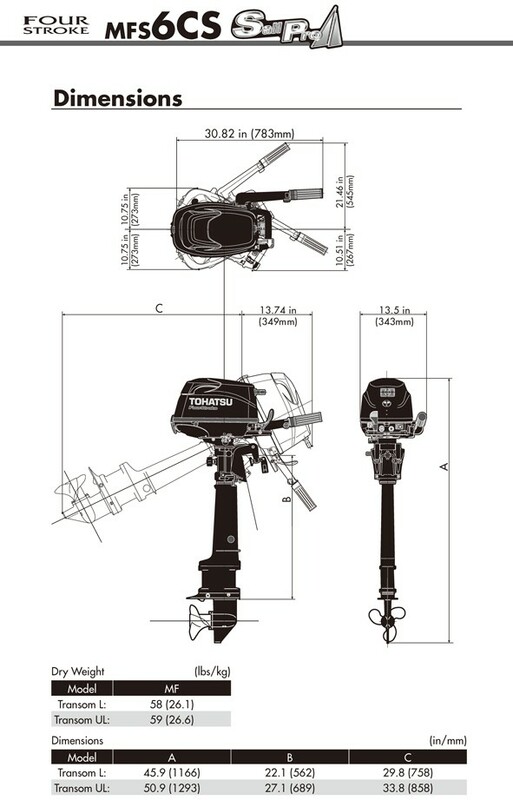 What outboard models have the 12V charging system pre-installed? Electric start model engines automatically come standard with the 12V charging system pre-installed from the factory as well as the 6hp Sail Pro models. You simply connect the 8.2 ft positive/negative electric start battery leads (provided) to your battery. Which size inflatable boat is right for me? There is no simple answer to this question. You should evaluate how you intend to use your inflatable boat and plan accordingly. Each of the boats in the Duras line offer wood floor options, and the DX86, DX96 & DX104 models offer air floor options. All models have differing specifications on the maximum number of people, weight and horsepower of proper engine. Consult with your local dealer to discuss your needs and find the model that's right for you. What is the construction of a Duras inflatable boat? The 1000 Denier hull material is a rugged, solid fabric that operates with a 3.6 PSI working pressure. All Duras boats feature three air chambers within the tube and an inflatable keel. The air chambers are completely separate and ensure buoyancy in the event of a single chamber failure. The Duras line of inflatable boats also features a double layer of PVC material on the underside for extra protection. How should I choose between the air and wood floor options? The different floor options on the DX86, DX96 & DX104 models are another way of customizing your inflatable boat. If you intend to inflate/deflate the boat for each usage the air floor offers increased speed and efficiency during this process. The wood floor may be a better option for those who intend to keep the boat inflated for long periods of time. How should I clean and care for my new Duras inflatable boat? When preparing to stow your new boat you should always wash off all debris and let it dry completely before storing. Do not use harsh chemical cleaners or cleaners containing abrasives or silicone as these may adversely affect the hull material. Do not store in extreme temperatures (i.e., over 150F/below -10F). You should always store your boat in a clean and dry place. How do I find and repair air leaks? If you are losing air pressure (unrelated to cold weather), check the boat for leaks, starting with the valves. The best tool to find leaks is soapy water in a spray bottle. Spray soapy water around the valve. If you see bubbles forming, check your valve seating and base to be sure the valve insert is screwed tight using the valve removal tool located in the repair kit. If you continue to have problems, it may be necessary to replace the valve. How do I repair rips or tears? Your Duras Inflatable Boat comes with a repair kit as standard equipment. If you no longer have the repair kit, you can order a new one from your dealer. Cut a patch of repair material large enough to overlap the damaged area by approximately 1/2", and round off the edges. The repair area must be roughed up using sandpaper or other abrasive material for glue to properly adhere to the area. Apply glue to the under side of the repair patch and around the area to be repaired. Too much glue will interfere with a proper repair. Allow adhesive to become tacky for 2-4 minutes, and then place the repair patch on the damaged area. Use a weight to apply 3-5 lbs. of pressure for 12 hours. After the repair patch has dried, apply glue around the edges for a complete seal (dry 4 hours). If you feel a repair is too large or difficult, you should contact your dealer for advice on the best way to fix your boat before proceeding. Is there anything I need to do before using the outboard? Engine oil must be added prior to use. The engine oil is drained by the factory prior to shipping. When your new outboard arrives, you simply add engine oil (amount and type are shown on page 1 of manual). The lower unit gear lube is pre-filled from the factory. No assembly is required. Even the propeller is pre-installed for your convenience. If you purchase an electric start model, your outboard will include battery leads pre-installed from the factory (battery not included). You simply connect the battery leads to your battery. Read the owner’s manual carefully prior to operation. The owner's manual contains important information regarding the break-in period, safety and proper use of your outboard engine. Are there any differences between Tohatsu and Nissan Marine? Tohatsu is the maker of all Nissan Marine outboards. They are identical with the exception of brand label (decals). Nissans are typically slightly higher in price as a result of the premium branding. There is no difference in features, specifications, or warranty. The only difference is the decals. If you are looking for a Nissan engine (or would like to know the comparable Tohatsu model) please contact us. Does Tohatsu make Mercury and Evinrude outboards? Yes. 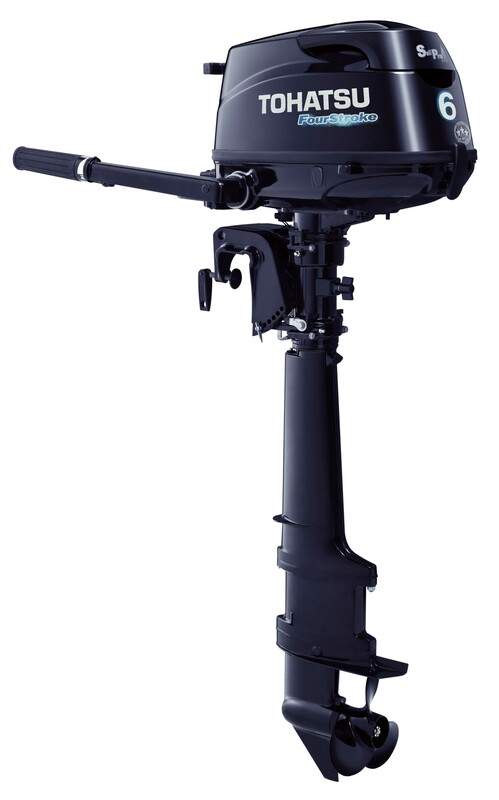 Tohatsu makes all Mercury outboards below 40hp and all Evinrude outboards up to 15hp. If you are looking for the comparable Tohatsu model please contact us. What is the break-in procedure for my new outboard? A break-in chart is included in your owner’s manual. Correct operation during the break-in period will prolong the life of your new outboard and will ensure optimum performance. Break-in consists of maintaining lower RPM levels and varying the RPM’s for the first 10 hours of use. Break-in should be done under a load (on your boat, not at home in a container of water). Are Tohatsu outboards salt-water rated? Yes. 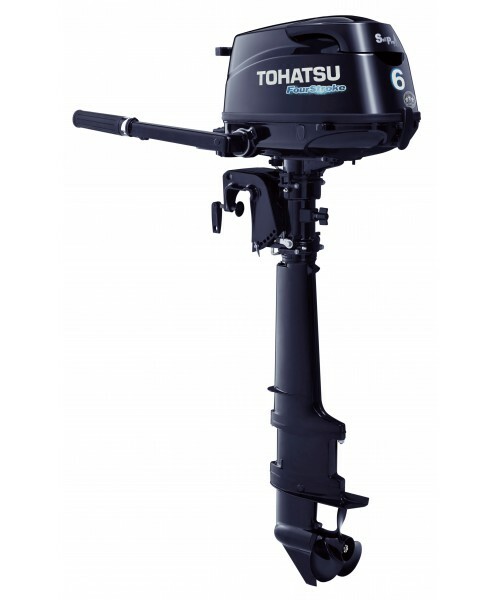 All Tohatsu outboards are designed for saltwater and freshwater use. These outboards are used by commercial fisherman worldwide and are prized for their long-term durability over years of demanding saltwater use. Does the outboard come with engine and lower unit pre-filled with oil? The outboards engine/crankcase are not filled with oil from the factory. You must add oil to the crankcase prior to use. The lower unit is pre-filled by the factory, however, you should check to ensure proper level before first use. To replace/add lower unit oil we recommend any SAE 80 or 90 weight oil. For additional information, see your owner’s manual on how to check or change the oil in your lower unit. What type of oil should I use in my outboard? Four-stroke outboards use 10W-30 or 10W-40 four-stroke motor oil. We recommend a FC-W rated NMMA (marine) certified four-stroke engine oil when available (10W-30 or 10W-40). Use of synthetic oil is not recommended in 4-stroke outboard engines. Outboards use raw water cooling systems and using synthetic oil may prevent the engine from reaching sufficient operating temperature. What type of gasoline should I use in my outboard? The minimum octane rating that you should use is 87, however, Tohatsu recommends using gasoline with an octane rating of 89 or higher when possible. When using fuel that may contain up to 10% Ethanol, you must use a marine grade fuel stabilizer to prevent damage to your outboard. This stabilizer must be used at all times. An automotive stabilizer may not be used as it will contain alcohol. Plugged carburetors are not covered under warranty. Can the outboard be laid on its side? Yes. If necessary, the engine can be laid on its side but it must be laid on the proper side. Your outboard includes a picture (decal) on the engine itself indicating which direction the engine can be laid. 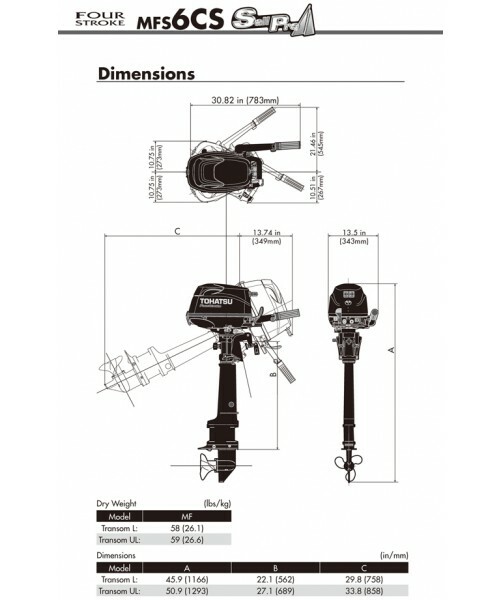 Please see owner’s manual for additional information on transporting and storage of your outboard. Do electric start models have a manual start also? Yes. All tiller operated outboards equipped electric start (30hp and below) also have the standard manual thru-cowling pull cord. You do not have to remove the cowling or do anything special. All electric start models also feature a 12V charging system as standard pre-installed equipment so engines can be manually crank started to recharge a dead or weak battery.